In your largest stock pot or dutch oven, put the pieces of chicken, the beef shank, peppercorns and cloves. Add enough water to fill pot about 2/3 full. Turn on high and bring to a boil. Once it comes to a boil, skim any scum and turn heat down to a simmer. Add the onion if using it whole. Allow to simmer until chicken is tender, about 60-90 minutes. Once chicken is tender, add the carrots and parsley root or parsnips. Leave pot uncovered, but turn heat up to bring to low boil. Wash parsley leaves well, take a piece of white thread, and tie parsley into a bunch. (I just wrap thread around it about 5-6 times) It can be folded over to keep leaves from falling off before tying. Add to pot of soup. Peel potatoes and wash and trim cauliflower into about 3 sections. Add cauliflower and then the potatoes, whole. Turn heat back down to simmer about 45-60 minutes . When carrots and potatoes are tender, add salt. Bring heat up enough to keep at a low boil for a few minutes until salt is dissolved, then turn heat off and allow soup to settle for about 10 minutes before serving. Freeze or consume within 3 days. This is a very healing, gluten free chicken soup that is a traditional European recipe from my family. We revert back to this soup whenever we accidentally get glutened or have a flu. Traditionally it is served as 2 or 3 courses. First the broth is strained and served (with noodles, and angel hair rice noodles can be used once you've healed) as a clear broth. The vegetables are then served next. The meat is served last with an accompanying sauce such as horseradish or a tomato or cherry sauce. If you prefer you can cut up all the vegetables. Before adding vegetables strain out the peppercorns and cloves. Take the cooked meat off the bones, cut up, and return it to the soup. Dice the onion, cut carrots and parsnip into rings, the cauliflower into florets, and cut the potatoes into 3/4 inch cubes. 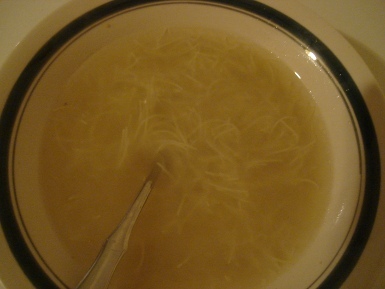 You can make your gluten free chicken soup with celery if you can't find parsley root or parsnips, but try to find one of them because they are very high in minerals. Add the carrots, parsnip and onions first, then the cauliflower and potatoes. You can also substitute parsley flakes, although they won't have as much nutrition as fresh parsley leaves. Use about 1 tablespoon of dried flakes. Add them with the carrots about 1/2 hour before soup is done. You can use the remainder of the fresh parsley later. Just wash, remove the bottom 2/3 of the stems, wrap with the thread, and wrap individual bunches in aluminum foil. Put the bunches in foil in a freezer bag and freeze. Just pull one out when you need it for soup. If you wish to make the tomato or cherry sauce, first make a roux. Allow it to cool for at least 15 minutes. For tomato sauce add one can tomato sauce, (8 0z can) and an equal amount of water (use empty can), about 1 tablespoon of sugar, and a pinch of salt. Bring it to a low boil over medium heat, turn down to a simmer, and cook until thick. (about 20 minutes). Can be reheated. For the cherry sauce, add about 3/4 cup of canned sour cherries and at least 1/2 of the juice. Keep at a low boil until the cherries pop open, and then allow to thicken. A dash of salt, and sugar to taste can be added. Thin with a little water if needed. Can be reheated. For horseradish sauce use prepared grated horseradish. To about 1/3 cup of mayonnaise add 1 teaspoon of sugar and blend well. Then add 2 teaspoons of grated horseradish and blend. Taste and adjust level of sugar or horseradish to your taste. Serve as a dip for the meat. Refrigerate any left over immediately.Use within 3 days.